TCC’s criminal justice students learn from mock crime scene at Liberty University. The body was on the side of a mountain. Lead detective Cody Klauer constructed a safe path for his unit to reach it, free of poison ivy and unsafe edges, all while limiting any intrusive influences to avoid contaminating the scene. Consider that Klauer is a Tidewater Community College student and the “body,” while indeed fully dressed, is a dead pig. 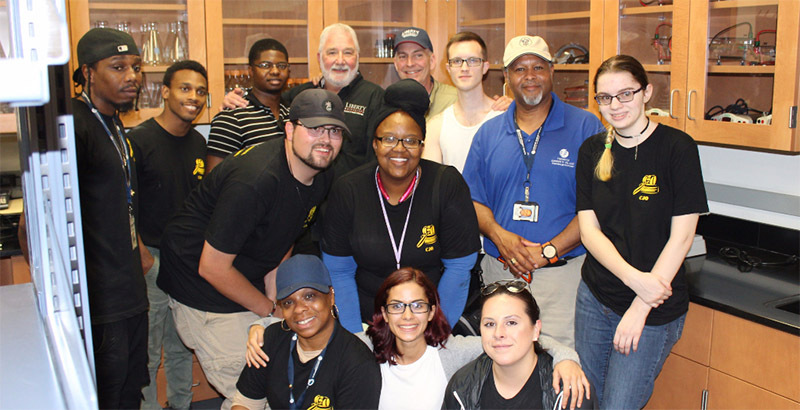 Klauer and 11 students working toward TCC’s Associate of Applied Science in Criminal Justice were part of a hands-on learning opportunity Professor Rick James arranged for the Portsmouth Campus Criminal Justice Club. 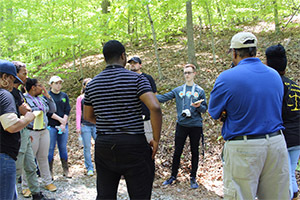 The staged mock crime scene was in the woods near Liberty University in Lynchburg with assistance of Professor J. Thomas McClintock, director of Liberty’s forensic science program. Officials from the FBI, the Virginia State Police and several county sheriff offices participated. Each student was assigned a specific role on the crime scene team. One student collected fly larvae to deduce the time of death; another constructed a diagram of the scene; another served as the forensic photographer. If you’re wondering why a pig was used, it’s because of the DNA similarities between pigs and humans. At the end, the students had a debriefing headed by Klauer. Among their challenges: Technology isn’t always going to work. Given the remote location, the students were unable to tap into a cell phone signal, leaving them without a handheld compass. “What should you do?” the students asked James. “What should you do?” James, in turn, fired back. The students realized they had to rely on the old fashioned compass rose, just one of numerous takeaways from the experience. “The students did not come back the same,” said James, contrasting the quiet on the bus ride there to the confident chatter afterward about all they had learned. “Not only was this a great opportunity to learn the ins and outs of a crime scene and how to break one down, but also a notable leadership exercise,” Klauer said. “The main thing I learned was that a crime scene is very frail and susceptible to contamination. From the moment a crime is committed, evidence of the act is left over, and any time someone enters and leaves that scene, something is given and taken away from the crime scene itself. Next year, James will participate in the actual staging of the scene.